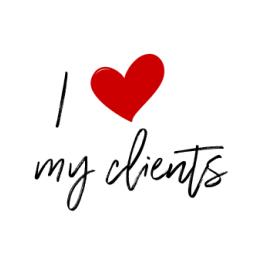 How About Showing Some Love to the Clients Who Already Love You? Are you keeping in touch with and taking care of your former clients? Is contact with your past and current clients a part of your overall marketing plan? If not, it’s time to spread some love around. You get back the love you give, so don’t drop off the face of the Earth as soon as a prospect becomes a satisfied client. With the right care and feeding, many happy former clients can turn into your personal army of word-of-mouth advertisers. Why Should I Market to People Who Already Know and Like Me? The goal of marketing to former clients is to turn them from merely satisfied users of your service to evangelizers of your brand. Studies show again and again that people trust the opinions of their friends and colleagues more than any kind of advertising. You can spend every penny of your budget on slick ads and an awesome website, but it just won’t compare to the return on investment that you get from a happy client. Think about it: Ann is searching for an attorney. She has never hired one before and is uneasy. She isn't sure she'll find somebody she will like and can trust, but Joe down the street raves about the lawyer who helped him after a serious accident. Do you think Ann is going to call Joe's lawyer, or the guy with the big billboard in town? The point is that you have to keep in touch with the people who love you so that you’re at the top of their minds when they talk with their friends and family. Consider this your call-to-action. Send birthday and holiday cards. It doesn’t have to be elaborate to make a difference. A simple card that is personally signed by you and those in your office lets your past clients know that you’re still thinking about them. Send former clients your newsletter. Your newsletter can let your former clients know about new offers, changes to your office, and what’s been going on with your business since they last visited. Make sure your newsletter is well-designed, fun, easy to read, and full of useful information. Otherwise, it is going to go right into the trash. Offer them your books and other free goodies. Got a new book or other free offer you're working on? Offer it to your former clients, especially if it is something you can mail to them. It is easy to delete an email, but harder to throw out a printed book or other useful item that you obviously put time, money, and effort into creating. Send thank-you notes. Did a past client refer somebody to you? Make darn sure you write a nice thank-you card, and maybe even send them something small in the mail. Just knowing that you took the time to appreciate their referral is important to many clients! Respond to their reviews. Similarly, when your former clients take the time to leave a review of your business or a testimonial for your site, let them know that you’re grateful. Your responsiveness lets them know that you’re still listening and willing to provide excellent customer service. Having trouble keeping track of your client list? Don’t worry. There are easy solutions out there. For example, our own DSS system tracks client information for you, as do tools from companies like InfusionSoft and Blue Orchid (both which integrate well with DSS). If you're looking for ways to keep all your clients—current, former, and future—happy, sign up for a free analysis or give us a call to discuss our awesome marketing options. We can talk about what’s working for you, what isn’t, and how to make the most out of the great work you do for your clients.